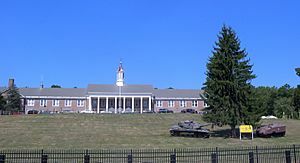 Essex County is a county in the northeastern part of the U.S. state of New Jersey. As of the 2016 Census estimate, the county's population was 796,914, making it the state's 3rd-largest county, an increase of 1.7% from the 2010 United States Census, when its population was enumerated at 783,969, in turn a decrease of 1.2% (9,664 fewer residents) from the 793,633 enumerated in the 2000 Census. In 2010, the county dropped down to third-largest, behind Middlesex County, and was one of only two counties in the state to see a decline between 2000 and 2010 (Cape May County being the other). Its county seat is Newark. It is part of the New York Metropolitan Area. The Bureau of Economic Analysis ranked the county as having the 94th-highest per capita income of all 3,113 counties in the United States (and the seventh-highest in New Jersey) as of 2009. The county is named after Essex, a county in the East of England. Based on data from the 2010 census, Essex County is the 14th-most densely populated county in the United States, and was ranked second in the state after Hudson County (which ranked sixth in the nation at 13,731.4 per square mile). 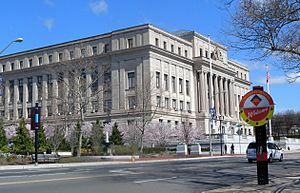 Newark, with a population density of 11,458.3 people/square mile, is the largest municipality in the county both in terms of land area (24.19 square miles) and population (277,140), while Caldwell is the smallest in terms of land area (1.17 square miles) and Essex Fells has the smallest population (2,113). Many of the county's smallest municipalities have population densities that are comparable to those of many big cities, and are well above the state's average which in turn is the highest in the nation. Like many of the counties of Northern New Jersey near New York City—which tend to have sharp divides between relatively rich suburban neighborhoods and less wealthy, more densely populated cities nearby—the eastern region of Essex County tends to be poorer and more urbanized, while the western parts tend to be more affluent and suburban. The wide area of Eastern Essex has significant pockets of high population, high building density, high poverty, and high crime rates. Within this general area however are many stable, mixed and middle-income areas of diverse populations. For example, north and west sides of Newark have well-kept suburban areas such as Vailsburg, Newark, New Jersey and Forest Hill, Newark, New Jersey. The east side of Newark is the Ironbound, a working-class Brazilian and Portuguese community. East Orange has the Presidential Estate neighborhood full of large one family homes. Belleville and Bloomfield are suburbs with historic Italian communities that, in spite of retaining a core Italian-American population, now have many immigrants from Latin America and Asia. As of the 2000 Census, 36% of Nutley residents indicated that they were of Italian ancestry, the 12th-highest of any municipality in the nation and third-highest in New Jersey. Beginning at about the turn of the century, this region led the state in the rebuilding and rehab of its housing stock. In the 2000s, Newark led the state in the issuance of building permits. Many reasons were cited: citywide incentives to encourage construction development, an improving local economy, the rising demand of low-cost housing so close to Manhattan. Newark has since then become one of the fastest growing cities in the entire Northeast. and reported a gain in median income and drop in poverty rate. This is a turnaround from the deterioration and abandonment experienced in the post-riot 1970s, 1980s and early part of the 1990s. Crime in this part of the county has traditionally been among the highest in the state and the country as well, but recently has also seen significant declines, mirroring its large neighbor to the east, New York City. By 2006, crime in Newark had fallen 60% over 10 years to its lowest levels in 40 years. Neighboring East Orange has seen crime fall more recently, dropping 50% in the three years (2005 to 2007). While crime rates have fallen in Newark and East Orange in recent years, they remain stubbornly high in these cities as well as Irvington, and Orange. In 2008, Newark had 67 homicides, down from 105 in 2007 and the record of 161 murders set in 1981. In contrast, Western Essex tends to be more suburban and affluent. Within this region are some of the most diverse and racially integrated municipalities in the state and nation, including Montclair, West Orange, South Orange and Maplewood. Many neighborhoods are well-known magnets for New Yorkers such as Glen Ridge, Montclair, Verona, South Orange and West Orange. The communities of Livingston, West Caldwell, South Orange, Maplewood, Millburn, North Caldwell, and Essex Fells are some of the wealthiest towns in the county. Short Hills in Millburn, South Orange, and Livingston have large Jewish communities. Livingston also has a burgeoning Taiwanese-American population, many of whom are highly educated white collar professionals with Ivy League degrees. Short Hills has a popular upscale shopping mall, The Mall at Short Hills located near affluent communities in Morris and Union counties. As the poorest place in the county, Newark has a median household income of $26,913 and a per capita income of $13,009; at the other extreme, Essex Fells, one of the wealthier places in the county and the 4th wealthiest municipality in the state, has a median household income of $148,173 and a per capita income of $77,434. Newark and Essex Fells are only 10 miles (16 km) apart. While many residents commute to New York City, Organon International, Anheuser-Busch, Automatic Data Processing, CIT Group, Hoffmann-LaRoche, W. W. Grainger, Dun & Bradstreet and Prudential have large facilities in Essex County or are headquartered there, and there are numerous factories and large office parks scattered throughout. Essex County was the first county in the country to create a county park system (Essex County Park System), to ensure that it did not lose all its land to development. The various municipalities of the county, especially Newark, the Oranges, and the Caldwells were seen on episodes of the HBO mob drama The Sopranos, which was set in North Caldwell. There are various attractions in Essex County, such as the Thomas Edison National Historical Park, Grover Cleveland Birthplace, Newark Museum, Montclair Art Museum, and the Turtle Back Zoo. The county is also home to Newark Liberty International Airport, Essex County Airport, and Port Newark-Elizabeth Marine Terminal. The Thomas Edison factory in West Orange. Essex was originally formed as one of four administrative districts within Province of East Jersey in 1675, together with Bergen, Middlesex and Monmouth districts. Essex County was formed within East Jersey on March 7, 1683. The county was named after the English county of Essex. When the provinces of East Jersey and West Jersey were combined in 1702, the county boundaries were retained. Portions of Essex were taken in 1741 and transferred to Somerset County. In 1837, Passaic County was formed from portions of Essex and Bergen County. In 1857, Union County was created from parts of Essex County. According to the United States Census Bureau, the county had an area of 129.631 square miles (335.74 km2), including 126.212 square miles (326.89 km2) of land (97.4%) and 3.419 square miles (8.86 km2) of water (2.6%). The county rises from generally flat in the east to the twin ridges of the Watchung Mountains in the western half, beyond which the land lowers again into the Passaic River valley. The highest elevation is found at four areas scattered between Verona, North Caldwell and Cedar Grove, reaching 660 feet (200 m) above sea level. The lowest point is sea level, at Newark Bay. All of Essex County has a humid subtropical climate. However temperatures do vary in various locations. In Newark, Eastern Essex County, and Southern/Southeastern Essex County, temperatures are relatively cool to hot, even in the winter months. Western Essex County has similar temperatures to Eastern Essex, but the elevation increase within the Watchung Mountains allows for some minor differences. An example would be that in January on Interstate 280 it could be raining in East Orange. Heading west on 280 there is a large hill that elevates from 150 feet (46 m) to 650 feet (200 m), a 500 feet (150 m) difference. At the top of the hill it could be snowing because of the 3 to 4 degree temperature differences. In recent years, average temperatures in the county seat of Newark have ranged from a low of 24 °F (−4 °C) in January to a high of 86 °F (30 °C) in July, although a record low of −14 °F (−26 °C) was recorded in February 1934 and a record high of 105 °F (41 °C) was recorded in July 1993. Average monthly precipitation ranged from 2.99 inches (76 mm) in February to 4.76 inches (121 mm) in July. As of the census of 2010, there were 783,969 people, 283,712 households, and 189,236 families residing in the county. The population density was 6,211.5 per square mile (2,398.3/km2). There were 312,954 housing units at an average density of 2,479.6 per square mile (957.4/km2)*. The racial makeup of the county was 42.59% (333,868) White, 40.88% (320,479) Black or African American, 0.39% (3,056) Native American, 4.57% (35,789) Asian, 0.04% (286) Pacific Islander, 8.38% (65,687) from other races, and 3.16% (24,804) from two or more races. [[Hispanic (U.S. Census)|Hispanic or Latino of any race were 20.30% (159,117) of the population. There were 283,712 households out of which 33.2% had children under the age of 18 living with them, 40.1% were married couples living together, 20.6% had a female householder with no husband present, and 33.3% were non-families. 27.7% of all households were made up of individuals, and 9.4% had someone living alone who was 65 years of age or older. The average household size was 2.68 and the average family size was 3.29. In the county, the population was spread out with 24.9% under the age of 18, 9.5% from 18 to 24, 28.6% from 25 to 44, 25.6% from 45 to 64, and 11.5% who were 65 years of age or older. The median age was 36.4 years. For every 100 females there were 92.1 males. For every 100 females ages 18 and old there were 88.6 males. The county has a notable Jewish population, with 76,200 Jewish residents according to the 2002 results of the National Jewish Population Survey. As of the 2000 United States Census, there were 793,633 people, 283,736 households, and 193,507 families residing in the county. The population density was 6,285 people per square mile (2,427/km²). There were 301,011 housing units at an average density of 2,384 per square mile (920/km²). The racial makeup of the county was 44.46% White, 41.24% Black or African American, 0.23% Native American, 3.71% Asian, 0.05% Pacific Islander, 6.88% from other races, and 3.42% from two or more races. 15.42% of the population were Hispanic or Latino of any race. Among those residents listing their ancestry, 11.6% were of residents were Italian, 6.9% Irish and 5.0% West Indian ancestry according to Census 2000. In the county, the population was spread out with 26.10% under the age of 18, 9.40% from 18 to 24, 31.10% from 25 to 44, 21.50% from 45 to 64, and 11.90% who were 65 years of age or older. The median age was 35 years. For every 100 females there were 90.70 males. For every 100 females age 18 and over, there were 86.40 males. The median income for a household in the county was $44,944, and the median income for a family was $54,818. Males had a median income of $41,374 versus $32,052 for females. The per capita income for the county was $24,943. About 12.8% of families and 15.6% of the population were below the poverty line, including 20.5% of those under age 18 and 12.2% of those age 65 or over. The county has a high Italian population, with significant percentages of residents (over 25%) in several communities, of the West Essex area and northeastern district, mostly in the northern half of the county, being of Italian descent. This includes the communities of Belleville (30.9%), Bloomfield (26.4%), Caldwell (26.3%), Cedar Grove (34.8%), Fairfield (45.8%), Nutley (44.5%), Roseland (38.7%), Verona (34.3%) and West Caldwell (35.2%). As of 2010[update], the county had a total of 1,667.98 miles (2,684.35 km) of roadways, of which 1,375.06 miles (2,212.94 km) are maintained by the local municipality, 213.12 miles (342.98 km) by Essex County and 60.68 miles (97.65 km) by the New Jersey Department of Transportation and 19.12 miles (30.77 km) by the New Jersey Turnpike Authority. Essex County is traversed by a number of highways. Three primary interstates and one auxiliary cross the county. This includes two long distance main interstates, one north-south (Interstate 95) from Miami and New Brunswick, Canada signed as the New Jersey Turnpike and one east-west Interstate 80 from San Francisco and Teaneck. East-West Interstate 78 from near Harrisburg and New York City also crosses the county. All of these only have interchanges in one municipality in the county, Newark for I-95 and I-78 and Fairfield for I-80. I-80 auxiliary route Interstate 280 passes through the county in a northeast-southwest direction and has exits in Roseland, Livingston, West Orange, Orange, East Orange, and Newark, making it one of the most important roads for intracounty travel. Essex County also has four U.S. Routes that cross it. Route 1/9 are concurrent and a freeway throughout their length in the county. They pass through Newark from Elizabeth in Union County to Kearny in Hudson County. It crosses over the Passaic River on the Pulaski Skyway, which bans trucks, so just before it leaves the county in the north Truck 1/9 splits for the traffic that is not allowed on the bridge. Truck 1/9 is also a freeway its entire length in the county. U.S. Route 22 eastern terminus is in Newark the only municipality it crosses in the county. It is a freeway along it route in Essex County. It connects Newark with points to the east. The last U.S. Route in the county is U.S. Route 46, which passes through Fairfield, where it is a major commercial road that parallels I-80. The most important state road in the county is the Garden State Parkway which passes north-south through the county, connecting Union Township in the south in Union County to Clifton in the north in Passaic County. It is a toll road, a freeway, and bans trucks of more than 7,000 pounds during its entire length in the county. It has one interchange in Irvington, one in Newark, two in East Orange, and four in Bloomfield. Outside the county, it is the longest road of any kind in the state. New Jersey Route 7 is a major arterial road in Nutley and Belleville. It has two discontinuous sections. The southern section starts at an overpass for Route 21 and passes over the Belleville Turnpike Bridge into border between Hudson and Bergen Counties. The northern section starts at the Newark/Belleville border passes through Belleville and Nutley until in crosses into Clifton. There are many buses that operate around the county, with New Jersey Transit (NJT) headquarters located just behind Newark Penn Station, a transit hub in the eastern part of the county. There are two major bus terminals in the county Newark Penn Station and the Irvington Bus Terminal. DeCamp Bus Lines operates buses from Essex county to the Port Authority Bus Terminal in Midtown Manhattan. Some of the NJT bus lines follow former streetcar lines. Essex County has a large rail network, but most of the network is focused at commuting to Newark and New York City. All of the passenger rail lines in the county are electrified; although, not all trains that use the lines are electric, because they connect to non-electrified track. NJ Transit has five lines that make stops in the county. All of them stop at either Newark Penn Station or Newark Broad Street Station. The Northeast Corridor Line from Trenton with connections from Philadelphia's 30th Street Station, Camden, and Princeton has stops at Newark Airport and Newark Penn Stations before continuing to Secaucus Junction and New York Penn Station. The New Jersey Coast Line from Bay Head or Long Branch also stops at Newark Airport and Newark Penn Stations before continuing to Secaucus Junction and New York Penn Station or Hoboken Terminal. The Raritan Valley Line from High Bridge usually terminates in Newark Penn Station, but mid-day trains continue to New York and one eastbound morning train terminates in Hoboken. The Montclair-Boonton Line from Hackettstown or Little Falls has six stations in Montclair, one in Glen Ridge, and two in Bloomfield before reaching Newark Broad Street Station and continuing to Secaucus Junction and New York Penn Station or Hoboken Terminal. The Morris and Essex Lines from Hackettstown and Peapack-Gladstone has two stops in Millburn, one in Maplewood, and two each in South Orange, Orange and East Orange before reaching Newark Broad Street and continuing to Secaucus Junction and New York Penn Station or Hoboken Terminal. The Newark Light Rail is completely contained within the county. It has 17 stations in Newark, Belleville, and Bloomfield and also operates out of Newark Penn Station. It is composed of two lines: the Newark City Subway and the Broad Street Extension. The Newark City Subway is the only surviving of the many street car lines that once crossed New Jersey, although it no longer uses street cars. It survived in part because it does not include street running, instead it follows the abandoned Morris Canal right of way before going underground. It has one station in Bloomfield and one in Belleville on the old Orange Branch of the New York & Greenwood Lake Service of the Erie Railroad before entering Newark and turning onto the Morris Canal right of way. From there it follows Branch Brook Park before turning into downtown Newark as a subway. It has nine stops in Newark before terminating in Newark Penn Station. The Broad Street Extension was built to provide connections between Newark Penn Station and Newark Broad Street Station and service to the waterfront of Newark. Leaving Penn Station, the line comes up from the subway and runs on streets or at grade for most of its length. It stops at NJPAC/Center Street, Atlantic Street, and Riverfront Stadium before reaching Broad Street Station. From Broad Street it takes a different route stopping at Washington Park and NJPAC/Center Street before arriving at Penn Station. The PATH also operates out of Newark Penn Station. It has direct service to Harrison, Jersey City, and Lower Manhattan. With a free transfer, the PATH also provides service to Hoboken, as well as Greenwich Village Chelsea, and Midtown Manhattan. Amtrak has two stations in the county, Newark Penn Station and Newark Liberty International Airport, both on the Northeast Corridor. Newark Penn Station has service on the only high speed train in the Western Hemisphere, the Acela Express, to Boston, Philadelphia, Baltimore, and Washington, D.C.. Penn Station also offers services on the Cardinal to Chicago; Carolinian to Charlotte; Crescent to New Orleans; Keystone Service to Harrisburg; Palmetto to Charleston; Pennsylvanian to Pittsburgh; Northeast Regional to Newport News, Norfolk, and Lynchburg; Silver Star and Silver Meteor to Miami; and Vermonter to St. Albans City all with intermediate stops. Newark Liberty International Airport is served by Northeast Regional and Keystone Service trains. Newark Liberty International Airport has a monorail called AirTrain Newark that connects the terminals, four parking areas, and the Newark Liberty International Airport Station on the Northeast Corridor. The monorail is free except for service to and from the train station. Newark Liberty International Airport is a major commercial airport located in the southeast section of the county in Newark and Elizabeth in Union County. It is one of the New York Metropolitan airports operated by Port Authority of New York and New Jersey. It is a hub for United Airlines. It is also a leading cargo airport and is a hub for FedEx Express and Kalitta Air. The Essex County Airport in Fairfield is a general aviation airport. Port Newark-Elizabeth Marine Terminal is a major component of the Port of New York and New Jersey. Located on the Newark Bay it serves as the principal container ship facility for goods entering and leaving New York-Newark metropolitan area, and the northeastern quadrant of North America. It consists of two components – Port Newark and the Elizabeth Marine Terminal (sometimes called "Port Elizabeth") – which exist side-by-side and are run conjointly by the Port Authority of New York and New Jersey. The facility is located within the boundaries of the two cities of Newark and Elizabeth, just east of the New Jersey Turnpike and Newark Liberty International Airport. Several important or noteworthy bridges currently or historically exist at least partially in the county. Most of them cross Newark Bay or the Passaic River into Hudson or Bergen counties. The Newark Bay Bridge carries I-78 over Newark Bay from Newark to Bayonne and is currently the most southern bridge crossing the bay. The Upper Bay Bridge, a vertical-lift bridge located just north of the Newark Bay Bridge, carries a freight train line over the bay from Newark to Bayonne. The PD Draw is an abandoned and partially dismantled railroad bridge across the Passaic River from Newark to Kearny. The Lincoln Highway Passaic River Bridge carries Truck 1/9 across the Passaic River and is currently the southern most crossing of the river before it reaches the bay. It is a vertical-left bridge and was the route that the Lincoln Highway used to cross the river. The Pulaski Skyway, the most famous bridge entirely in New Jersey, carries Route 1/9 across the Passaic River, Kearny Point, and the Hackensack River from Newark through Kearny to Jersey City. The Point-No-Point Bridge is a railroad swing bridge that carries a freight line across the Passaic River between Newark and Kearny. The Jackson Street Bridge is a historic vehicular swing bridge across the Passaic from Newark to Harrison. The Dock Bridge, listed on the National Register of Historic Places carries four tracks of the Northeast Corridor rail line and two tracks of the PATH on two vertical left spans from Newark Penn Station to Harrison. The Center Street Bridge is a former railroad, rapid transit, and road bridge connecting Newark and Harrison. The Bridge Street Bridge is another vehicular swing bridge across the Passaic from Newark to Harrison. Municipalities in Essex County (with 2010 Census data for population, housing units and area in square miles) are: Other, unincorporated communities in the county are listed next to their parent municipality. Most of these areas are census-designated places that have been created by the United States Census Bureau for enumeration purposes within a Township. Other communities and enclaves that exist within a municipality are marked as non-CDP next to the name. 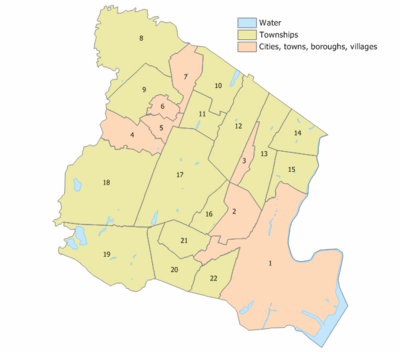 The municipalities of western Essex County have discussed secession from the county, to create a new county or be annexed to Morris County, spurred mainly by a belief that tax policy benefits the poorer, urban, eastern portions of the county at the expense of the wealthier, more suburban municipalities in the west of the county. From 2001 to 2003, Millburn, Montclair and Roseland all held nonbinding ballot referendums on the issue. Then-Montclair mayor Robert J. Russo gave a statement in 2003 about secession, "I've watched Essex County burden our people, with very little to show for it. We're fiscally conservative here and socially progressive -- and we're finally rebelling." Essex county was the first county in the United States to have its own parks department. It is called the Essex County Park System. Essex County, New Jersey Facts for Kids. Kiddle Encyclopedia.